Dr. Firas Ali received his Doctorates in Dental Medicine from Tufts University school of Dental Medicine in Boston Massachusetts. After graduating from Tufts University, he went on to complete his residency training in Oral and Maxillofacial Surgery at the Loyola University Medical Center in Maywood Illinois, regularly ranked by U.S. News and Chicago news as one of the Nation’s best hospitals. He was named one of America’s Top Dentists in Oral and Maxillofacial Surgery by the Consumer’s Research Council of America for 2009. While in Dental School, he was a National Dental Board Honors recipient and a High clinical achievement recipient. He also received an Appreciation award from Special Olympics Health Athletes for Participating in volunteer cancer screening for patients with special needs. Dr. Ali is a Diplomate of the American Board of Oral & Maxillofacial Surgeons and is board certified by the North East Regional Board of Dental Examiners. Dr. Ali is a Fellow of both the American Association of Oral & Maxillofacial Surgeons and the International Association of Oral and Maxillofacial Surgeons. Dr. Ali holds a surgical fellowship from the Misch International Implant Institute. He is a member of the Pennsylvania Society of Oral And Maxillofacial Surgeons, the American Dental Association and the American Dental Society of Anesthesiology. Dr. Ali is trained in Advanced Cardiac Life Support, Basic Life Support and Cardiopulmonary resuscitation, and in Advanced Pediatric Life Support. Dr. Ali participated in multiple published and non-published research papers as well as academic and professional presentations. He is on medical staff at the Dubois Regional Medical Center, ELK Regional Health system and practices the full-scope of oral and maxillofacial surgery with special interests in Dental Implants and Facial Cosmetic Surgery. Dr. Ali is dedicated to providing the highest quality of patient care. He regularly attends continuing education seminars to bring the most advanced knowledge and newest techniques available to his practice. 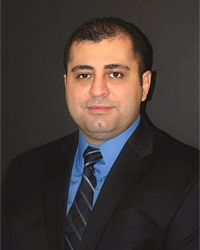 Dr. Ali is also a member of the American Academy of Implant Dentistry.